Summers on Maui mean long days at the beach, catching a surf session before or after work, and sunsets, sunsets . . . and more sunsets. What better way to round out the day than chillaxing with friends on our lanai? 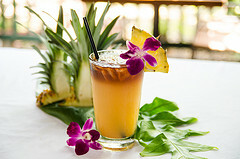 We’ve got local, live music every day and a great Happy Hour menu from 3 to 6 p.m. and 9 to 10 p.m. featuring half off pupu (appetizers) and $3 drink specials including mai tais, margaritas, well drinks, wine and beer. You can dine on the lanai for breakfast, lunch and dinner, too. The lanai accommodates 50 people, so bring your friends and ‘ohana. There’s plenty of shade from the monkeypod trees and umbrellas. Easy living doesn’t get any better than this. We’ve been working on rebranding Three’s Bar & Grill so you can get a feeling of who we are and what we’re all about with just a glance. We are 3 chefs who surf and became friends through a common passion for the ocean and cooking great food. Our food and restaurant reflect the Maui lifestyle we all enjoy, and we wanted that to come across in our brand. We have launched a new WordPress website at www.threesbarandgrill.com that will allow us to interact with our customers and friends of the restaurant. You will notice the fun graphics that are a part of our new brand, and you’ll see this when you enter the restaurant, on our menus and signage, in our advertising, and on our social media sites on Facebook, Twitter and Instagram. Our new catering van is sporting the new look, too. As always, reservations are accepted on our website or by calling 808.879.3133. We will be showing up at events around the island this year, so be sure and stop by our table to say “aloha” and try Three’s food. The Three’s Bar and Grill chefs Jaron Blosser, Travis Morrin, and Cody Christopher are rock’n! Great story in Scene. Mahalo Carla Tracy and The Maui News!